In order to retain a remarkable position in this industry, we are providing a wide array of Commercial Two Burner. 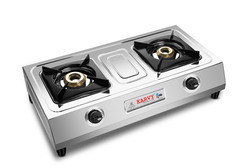 We are providing a varied series of 2 Burner Gas Stove, which are available in varied specifications that meet on consumer’s demand. This 2 Burner LPG Gas Stove which are made up of great quality components and are able to cook the food in least amount of time. In addition to this, these burner gas stoves are available in bulk and are ideally suited for use at homes and at industries. Last but not the least, these are available at suitable prices.